Tough period: A Hyundai showroom on 24 Ocober. Analysts expect sales to dip further in the months ahead with the end of the festive season. Mumbai: New model launches and the festival season failed to lift sales of auto companies in October, as rising loan rates and high fuel costs kept buyers away from automobile showrooms. Sales at India’s top three car makers—Maruti Suzuki India Ltd, Hyundai Motor India Ltd and Tata Motors Ltd—either declined or rose marginally, indicating a broad-based demand slowdown. The three companies account for more than 70% of total car sales in India. “We believe rising costs, higher fuel prices, inflation have a more direct bearing on disposable income and, hence, on consumer decisions on purchases than interest rate increases alone," said Subrata Ray, senior vice-president and co-head of corporate sector ratings at Icra Ltd.
Labour unrest at its plants in Gurgaon and Manesar coupled with a slowdown in demand for its petrol models struck twin blows to market leader Maruti Suzuki. The company’s October sales halved to 51,458 units from a year earlier. Maruti lost production of more than 40,000 units in October, the company said in a statement. Hyundai Motor India also saw its sales drop 5% to 33,001 units, despite a positive response to the launch of its entry-level compact car Eon. Pitted against the Maruti Alto, the Eon has received bookings of 9,000 plus units so far, the company said in a statement. Tata Motors, the third largest car maker, saw sales rise 3% to 24,124 units. Sales of the Nano small car, though on a low base of last year, increased 26% to 3,868 units. 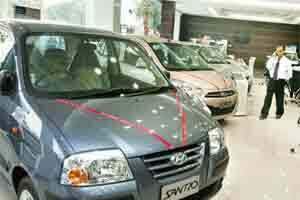 The sales were also helped by the new Indica variant. Mahindra and Mahindra Ltd, the country’s largest utility vehicle maker, benefited from new model launches and demand for its older vehicles. The company sold 18,756units of passenger vehicles (utility vehicles and cars), an increase of 10% over October last year. The local arm of General Motor Co. saw sales remain flat in the month. The company sold 10,062 cars and utility vehicles compared with 10,051 units a year ago. General Motors plans to ramp up production of the diesel variant of its Beat hatchback. Sales at Toyota Kirloskar Motor India Pvt. Ltd and Volkswagen Passenger Cars India Pvt. Ltd rose, though on a lower base. With the exception of Maruti, which may see sales growth in the months ahead as it resumes its normal production schedule, auto companies could be headed for a lull owing to a shift in a buyer preference for diesel models, said Surjit Arora, an analyst at brokerage Prabhudas Lilladher Pvt. Ltd.
“Most of them have been caught unawares and not prepared to meet such a huge demand for the diesel models, resulting in a waiting period of three months to six months," Arora said. Meanwhile, led by market leader Hero MotoCorp Ltd, two-wheeler sales continued to grow in October. Hero MotoCorp maintained its sales momentum in October and despatched 512,238 units against 505,553 a year ago. Sales at India Yamaha Motor Pvt. Ltd and Honda Motorcycle and Scooter India Pvt. Ltd also rose over October last year.